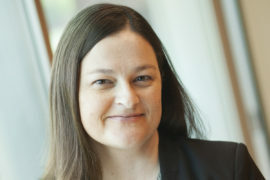 Andrea Reinkemeyer, assistant professor of music composition and theory at Linfield College, will present “Gesture, Imagery, Noise: Transforming Imagination to Music” on Wednesday, April 12, at 7 p.m. in the Richard and Lucille Ice Auditorium, at Linfield. Reinkemeyer will give a deep analysis of her work with insights into the compositional process. She will discuss and demonstrate recent pieces including, “Wild Silk” for baritone saxophone, percussion and piano, and “The Thaw” for soprano, tenor, mixed choir and wind ensemble. Reinkemeyer joined the Linfield faculty in 2014. Her music has been performed both nationally and internationally, by the Albany (NY) Symphony, Detroit Chamber Winds & Strings, University of Oregon Wind Ensemble and University Singers, American Composers Orchestra Underwood New Music Readings and others. The lecture is free and open to the public. The Linfield College faculty lecture series offers one presentation each month. For more information, call 503-883-2409.